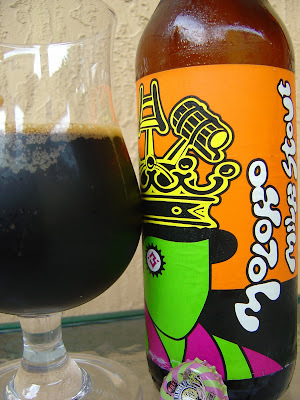 Tonight I'm drinking Moloko Milk Stout brewed by Three Floyds Brewing in Munster, Indiana. Indiana? Yep! Beer 6 from Trade 2 with Marathon Marie (who for some reason now goes by Cheery Pants. Atheists!). 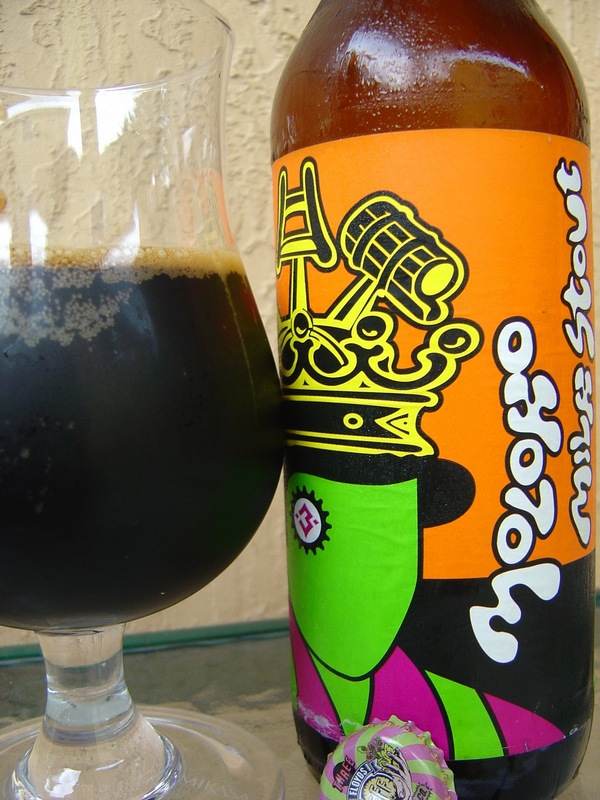 The label is strange--a green-bodied faceless dude has a weird crown while the raspberry color over Granny-Smith apple green over a Syracuse-Orangeman orange background with black accents and white and green freestyle bold lettering. A little trippy. Sweet, rich chocolate aroma with a touch of vanilla there as well. Rich chocolate and lightly roasted coffee flavors dominate in the beginning. Some vanilla and licorice flavors also show up and keep popping in and out throughout all of big 22. All of these flavors are wrapped in a nicely noticeable envelope of boozy alcohol. The alcohol is also very warming, especially in the chest. The texture is smooth and creamy, just excellent. The carbonation is medium, more than typical for this style and more than welcome as well. Medium body also. Moloko is definitely sugary sweet, yet has just enough bitter balance to not be annoyingly sweet. The finish is dry and the aftertaste is very nice as well. Really a great beer all around. Hmmm. I think they'd love me in Indiana! One last comment: the label uses the word "Naked" and phrase "Mouth Feel" in the same sentence. Guess you'll need to find yourself a bottle to see why! My photography just isn't that good! The bottle art (and name) is a nod to A Clockwork Orange - remember the Moloko Milk Bar? I've never had the pleasure of this brew, but I've enjoyed Three Floyds Gumballhead, Alpha King and Dreadnaught and they were all outstanding. This is currently my favorite beer. Thanks for covering this one! Marie. Ah. A Clockwork Orange. I knew it was a freak motif. No, don't remember Moloko Milk bar. Hmmm. BeerGeek. Eventually you will cross paths with this one. Barry. I knew it, just as planned. Glad to have finally hit someone's favorite!